Everyone in any religions, nationalities, and races wishe bright future and peace to the world. Our wish is to share these. We wish to perform the peace concert and the festival of prayer and to pilgrimage over the world with you. Let's join the Caravan ! 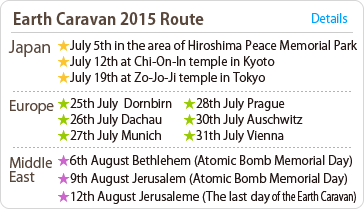 There will be global peace events held this summer as part of "Earth Caravan 2015" by NPO uni of Kyoto city Kyoto prefecture. The main program, "Peace Cycling", is to carry the " the flame of peace" from Hiroshima, where the flame has been burning since the nuclear bomb was dropped, to Tokyo. Then it travels to Europe. The flame passes on to European cities devastated by war such as Auschwitz. Palestine Jerusalem, where conflict is ongoing, is the last city to visit. Four major religions (Buddhism, Christianity, Islam, and Judaism) will get together to pray for peace and all the lives sacrificed by war. We will get together in front of the " the flame of peace", then wish for all to overcome the differences of nationalities, races, and religions and to rid this world of war. This is the first attempt ever made in the world. 【Shing Share】Theme song of Earth Caravan "Share"
"SHARE!" sang by people from 18 different regions of the world. Upload your version of SHARE! to Youtube ! Inform us your posting URL to We post your URL on our introdusing page. Dr. Izzeldin Abuelaish, a Gaza doctor, who lost three of his daughters from the Israeli military incursion. to Tokyo via Kyoto with "the flame of peace"
and several places in the world. We are posting your wish to "message to all". Let's make a wish of what we can do for the future and a peaceful world! Create an art exressing your wish for the peace. The Wish For The World Project invites children and adults to express their wish for a better future forthe world. Afeter all, total is $138 billion. Still only 17% of total !! Copyright © NPO-UNI All Rights Reserved.